Photo courtesy of AO Smith. Voltex (R) hybrid electric heat pump. If you need a new water heater and your basement is somewhat humid and musty, you might consider a heat pump water heater to solve two problems: heating the water and conditioning the air. Heat pump water heaters may sound complex, but they operate just like your refrigerator in reverse. The refrigerator takes heat out of the interior to keep food cold and puts it into the kitchen. A heat pump water heater takes heat out of the air around it and puts it into the water. If there is high humidity in the basement, the heat pump water heater also acts like a dehumidifier, as it extracts heat from the basement air. The air coming from the heat pump tends to be between 45 and 50 degrees, so it is as dry as a fall day. In my house, with four people using hot water for showers, dishes, clothes washing, etc., we use an average of 60 gallons of hot water a day. The GE GeoSpring™ heat pump water heater we installed in 2012 heats our water for about 75 cents a day. Prior to installing it, our water was heated with a boiler-tied water heater—which consumed about a half-gallon of oil per day—and we used a dehumidifier in the basement during the summer months. The dehumidifier is no longer required, and the heat pump water heater keeps the basement drier than it ever was using a standard dehumidifier, providing even further savings. Controls on the heat pump allow us to set the hot water temperature, to lower it during vacations and have it automatically return to normal before we get home. We can also operate the unit using standard electric heating elements, the heat pump or in “hybrid” mode, which is a combination of the two and can be useful when guests are visiting and more hot water is needed. For about a year, I measured several parameters associated with the heat pump water heater installed in the walkout basement of my three-bedroom cape-style home. I measured the temperature and humidity of the basement air and the air leaving the heat pump; the temperature and flow of the hot water; the condensate produced from the heat pump and the current (amps) used to power the water heater. The basement temperature was in the upper 60s during the summer and dropped to the upper 50s during the winter. Discharge air temperature from the GE GeoSpring™ water heater was roughly 48 degrees. The humidity in the basement was maintained in the 50-55% range even during the wettest part of the summer, compared to humidity in the range of 70-80% measured before the installation. The unit generated hot water using 5-6 kWh per day. The efficiency was decreased in the winter by lower inlet water temperature (56 down to 48 degrees) and by the lack of condensate production with the dry winter air, but still peaked at an average 6 kWh per day. A typical, fairly efficient electric water heater, by contrast, would use about 12 kWh per day to heat the same water. 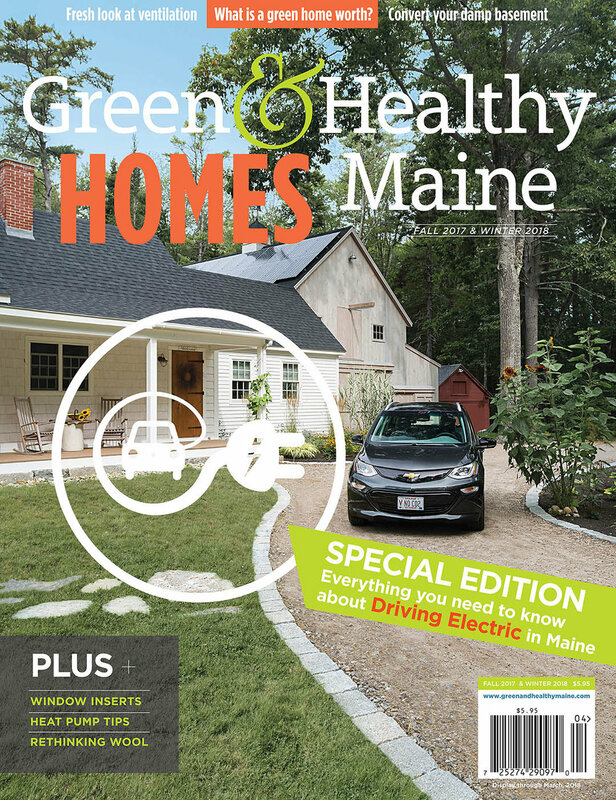 The savings in Maine at consumer electric rates of 14-15 cents per kWh is about $300 per year. At the time of purchase, Efficiency Maine was offering a $300 rebate. Between the savings in electricity costs and the rebate from Efficiency Maine, we realized a payback in just three years’ time (purchased for $1200 minus $300 Efficiency Maine rebate, net cost of $900). Note: At press time, Efficiency Maine was offering a rebate of $750 on this same product, so payback time could be even sooner. Installation of a heat pump water heater is the same as a standard electric unit. However, it really needs to be separate from the rest of the house due to the noise of the fan and the cooled air that results from operation (remember, the heat pump takes heat out of the air and puts it into the water. That is going to cause the air to be cooler). For these reasons, they are not well suited to installations in a closet within living space. But if your house has a damp basement, this type of unit might be just right for you. Steve Caulfield is a board member of the Maine Indoor Air Quality Council and President of Turner Building Science & Design, LLC. For more information, contact the Maine Indoor Air Quality Council at www.maineindoorair.org or 207-626-8115.